Taylor Hicks (and some of the Alabama cheerleaders) feeling some team spirit at the Iron Bowl earlier today. Pretty nice picture of Taylor. I hope he skeedaddled to RI after that! So if he was there cheering on Alabama does that mean they lost? AND, he’s in today’s color! Black. Looks like Taylor and only one of the cheerleaders were looking at the same camera. Gotta love Taylor Hicks!!! wildrosegirl — no, Alabama won. Definitely feeling some Taylor Spirit tonight! Hey – I just watched part of this game! Had my eyes peeled for a Taylor sighting – and you came up with one !! Glad to see he was there. You never cease to amaze me with the pictures you find, both great shots, thanks! SWEET! Thanks to the Bloggerina Extraordinare we don’t have to wait for tomorrow’s newspapers! Everybody looks cute and VERY happy that Alabama won! I believe the saying is “Roll Tide”! Nice find, TsH! Why does he always pose with the cheerleaders? Hmm? I kept watching the game hoping to get a glimpse of Taylor. Thanks for the great pics. He looks SO handsome in both pics, but that’s not much of a shock, is it? Wow Tays…. thanks. I think you are magic. How do you do it. These are great. He is so beyond handsome its pathetic. on November 29, 2008 at 11:16 pm | Reply J. Very nice to see some new pics. Pretty! I hoped he would make the game this weekend, before he reports for work tomorrow or monday. I’m a HUGE Taylor cheerleader!!! Always have been, ALWAYS will be! What can I say? He looks so happy and so handsome in both! And I am very excited that he is going to be up north for a bit…he may just see some snow! Thank you so much TH for your keen eye and quick fingers on the keyboard! What would we do without you! Damn, that second picture! Excuse me, but my oh my! Love that look. Thanks, TaysH. Wow! So cool to see the pictures. I guess we all knew he would be there, be there, be there!!!!! How could he stay away? I hoped he was with his family in Alabama for Thanksgiving holiday, because he’s gonna be on the road for quite a long time now. Well, I guess he gets a break for Christmas too. I always think it is so amazing that this guy manages to have a career, and still make sure he attends the college football games he wants to attend! Now he has worked out a way to go on tour, and still promote his single, the CD, and even work in an “intimate club tour” as well, and he doesn’t have to fill the gas tank. What a smart business man our SoulMan is!!!! The one smiling is more like him. I guess he can’t smile all the time. Love him either way. Man, he’s looking mighty fine. I’ve missed that face- smiling or not. Soo glad he was at the game-I figured he would come home for the holidays seeing as how this is his last weekend off-except for Christmas and I was hoping that he would go to the game. But I am SOOO glad to see him having a good time! Now-let’s get that BSD cranked up!!! Thanks for this!! Oh-forgot to mention–looks like he’s been experiencing some of that Bham “love in the food’-but it’s still OK!!!! Thanks! I just hope to see more of Taylor from now on; have missed him! 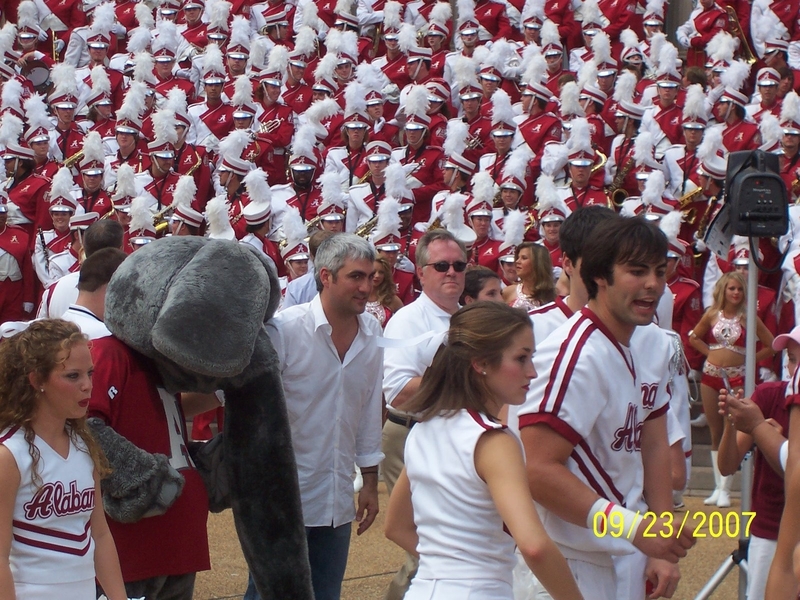 Nothing like Thanksgiving and football….except Taylor Hicks! I’m glad he’s had some family time and football time before his Grease run begins again. My college team won a very important game yesterday! Go Eagles! Looks like winners stick together. So great to see Taylor out & about, relaxing & having fun. waterfall: the only club date scheduled so far is in Maryland, but I’m keeping track at my blog, cuz I’m going to jump on one of those gigs if I can! TsH, thank you for the Taylor sigting. I don’t know how you do it, but I am soooooo glad you do! Thanks for the great pics….he looks rested and relaxed. I’m glad he could spend some down time enjoying the game, and that he didn’t bring the usual jinx. I can’t seem to stop looking at his eyes in pic #2, they’re very arresting somehow. Bill is getting a little better with the FLOWBEE….just seems to lose it a little on the left side. But any Taylor is a gorgeous Taylor! I’m so glad he was able to go to THE game! I think only those of us that are from Alabama understand the importance of bragging rights for the next year! Does anyone know who he was with? Heck-I’m gonna have some fun with the Bama vendors tomorrow-MAYBE I can divert the flow of “you lost and we won” with these pics-but then again you know how football fans are in Alabama when it comes to rubbing it in!!! Anyway TH-thanks for the great pics!! Amazing to have these pictures up so soon.!! Love both of them. Taylor is such a huge football fan, I wondered if he would be there..good for him. He looks great! You are wonderful!! Thank you so much for the great photos of Taylor from the Bama – Aub. game, WOW!! The man in the second photo is Mal Moore – the Athletic Director of the U of Alabama. I think that someone asked in a post. TayMan looks so good!